At first glance, 90-year-old Vivian has nothing in common with Molly, a troubled teen-ager. Vivian is well-off and white, originally from Ireland, while Molly is poor and half-Penobscot Indian. When Molly is caught stealing a copy of “Jayne Eyre” at the public library, she must either perform community service by helping Vivian clean her attic, or go to a juvenile center. She chooses the former, bringing the two together. The novel is told from the points of view of Molly and Vivian, alternating between present-day Maine, where the story is set, and the past, from1929 to 1943. As the book unfolds, we see that the two have a lot in common. Vivian Daly, born Niamph (pronounced Neeve) Power, is among the thousands of homeless immigrant children from the East Coast who are put on the “orphan trains” to find new homes in the Midwest. Niamph’s name is changed to Dorothy when she lives with the Byrne family, who uses her for her labor in a dressmaking factory. Next she lives with the Grote family, who uses her as a babysitter. She is within a hair’s breadth from getting raped when she flees in the middle of the night. Thankfully, a school teacher and her landlady help place the girl in a loving home. She finds a new family and acquires a new name: Vivian. We follow Vivian through the years, as she reconnects with a fellow orphan-train child named Dutchy, whom she marries. Just as we think Vivian has found a happy ending, Dutchy is killed during World War II. Similarly, Molly has her share of difficulties. Her father died in an accident; her mother is in prison. She has bounced from one foster family to another. Her boyfriend Jack is the first person to love and accept her. Toward the end of the book, Vivian becomes the second person who gives her the affection she deserves. Christina Baker Kline writes in a straightforward manner, avoiding sentimentality in telling Vivian’s Dickensian childhood. She has created two memorable characters with a compelling emotional journey. 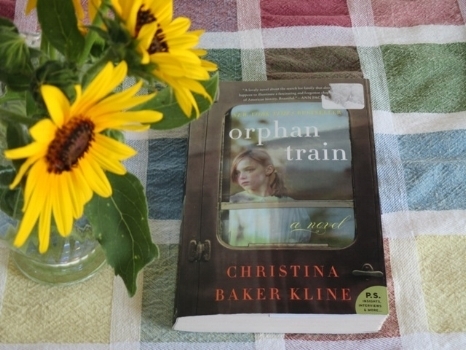 Kline, the author of four other novels and four nonfiction books, was considered a mid-list author prior to “Orphan Train.” With this book, she has become a bona fide best-seller. “Orphan Train” gained momentum not because of relentless marketing campaign or social media promotion, but through old-fashioned word-of-mouth buzz. I’m one of those readers who want to spread the word: This is a well-written, well-researched historical novel about a largely forgotten part of American history. I highly recommend it.